Today is the first day of the Wall of Fame. 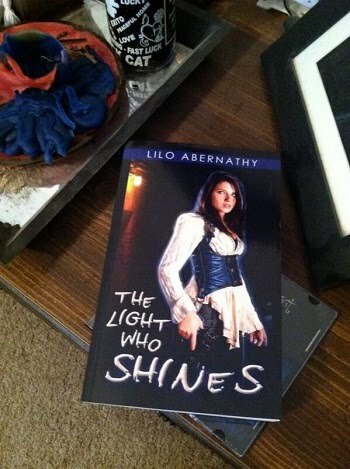 Lilo Abernathy gets a tweet from a reader with a picture of The Light Who Shines that just arrived in the mail. This is the first picture Lilo has ever gotten from a reader of her book. Lilo made a post of this on facebook and vows never EVER to delete it. Lilo Abernathy is a born bibliophile who stormed the Indie scene with her debut novel, The Light Who Shines, in early 2014, making it to Amazon's Top 100 list in the same year with strong support from the Indie community. Since then she's only averaged about five hours of sleep a night and that doesn't seem to be changing soon. She's clearly not an editor as evidenced by her post I Am Not an Editor. If you respond to her Oh My Liberal Bleeding Heart! posts, she asks that you please observe the Rules of Engagement. Check out her epic urban fantasy / paranormal romance novels.